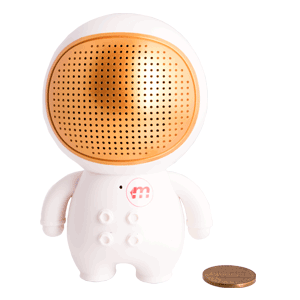 Small portable wireless speaker that will provide hours of crystal clear audio experience both indoors and outdoors. 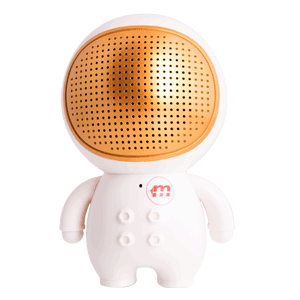 This excellent speaker has been crafted in the likeness of The Malektronic Rocketman a.k.a. Tampa Bay Lightning Astronaut. 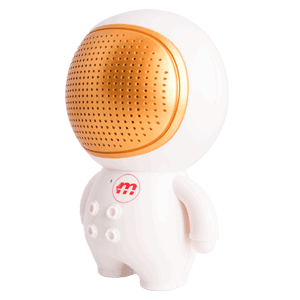 So to celebrate The Malektronic Rocketman's success and populatity it was only a logical step to imortalize Rocketman as a wireless Speaker. Malektronic designs and manufactures premium wireless audio products. Portable and full of features. Its size allows for carrying in a purse, backpack, even the pocket of a coat or pants. 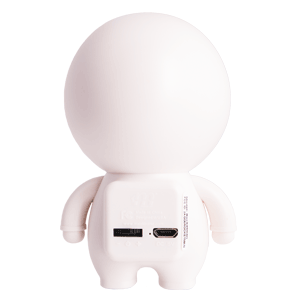 Also on the back is the convenient Micro USB port for charging your Rocketman.